Teamsters Picket, Cause Traffic Jam, At SF Tech Bus Company That Cut Deal With Fake Union; Politicians Threaten to Pull Permits | Godwin, Morris, Laurenzi & Bloomfield, P.C. By Godwin, Morris, Laurenzi & Bloomfield, P.C. of Godwin, Morris, Laurenzi & Bloomfield, P.C. on Wednesday, March 23, 2016. Photo: Leah Millis, The Chronicle Ray Torres leads chants as other Teamsters surround a Bauer's Intelligent Transportation bus during a protest against the company at a Muni stop also used by tech buses at Eighth and Market streets. A private bus company that transports tech workers to their jobs in Silicon Valley could see its permits in the city's corporate shuttle program revoked because of a labor dispute with its drivers. Bauer's Intelligent Transportation, which operates buses for Zynga, Cisco and Electronic Arts, once again finds labor tensions threatening its business -- two months ago the Super Bowl 50 Host Committee rejected its bid to transport workers and fans because of the threat of Teamster picketing. That threat became a reality Tuesday morning, as roughly 100 Teamsters picketed Bauer shuttles at Eighth and Market streets as they picked up workers, purposefully causing a traffic jam in the process. 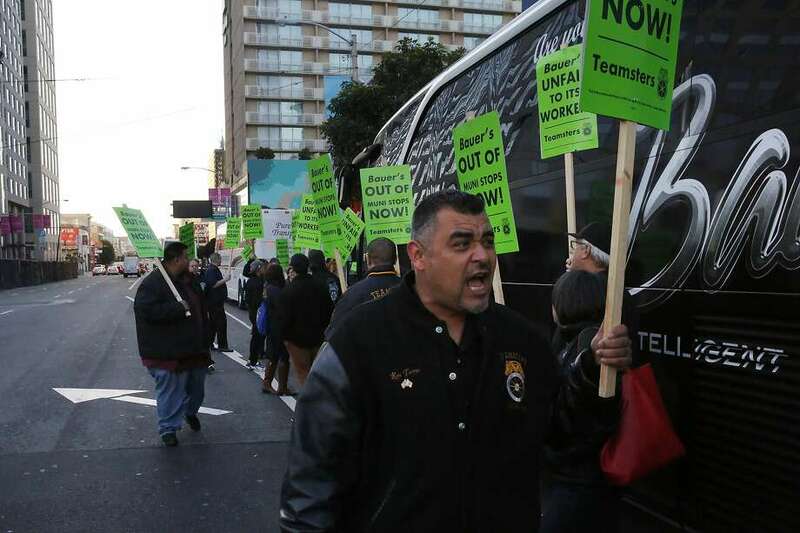 A few hours later, a cross-section of San Francisco supervisors introduced a resolution calling on the Municipal Transportation Agency to remove Bauer from the city's commuter shuttle program because of its conflict with drivers over pay, benefits and unionization efforts. The resolution also notes the traffic disruptions caused by picketing. The commuter shuttle program allows private bus companies to use the city's Muni stops to pick up and drop off workers. "We are sending a message to Bauer and their clients -- Cisco, Zynga, Electronic Arts -- that it's time to get with the program and achieve labor harmony," said Supervisor Aaron Peskin, who authored the resolution. "Virtually everybody else has done it, and it's time for Bauer to do right by the tech bus drivers." Supervisor Scott Wiener, who is often in conflict with Peskin, signed on as as a co-sponsor. Last year, Wiener authored a resolution requiring "labor harmony" for bus companies in the city's corporate-shuttle program. "When we passed the labor harmony resolution we meant it," Wiener said. "These weren't empty words." Cisco spokesman Nigel Glennie said the company contracts with another company that in turn contracts with Bauer. "Although a small number of our San Francisco-based employees travel to our headquarters on their buses, we do not contract with Bauer's directly," Glennie said. "We respect the right of Bauer's workers to ask questions of their employer." Zynga and Electronic Arts declined to comment. The MTA issues permits to 15 bus companies in the shuttle program. Many of those companies have faced criticism over the working conditions for drivers. In a push for higher wages, some tech shuttle drivers have joined unions, including drivers for Google, Facebook, Apple, Yahoo, Genentech, eBay and WeDriveU. When the Teamsters began trying to organize Bauer's drivers last year, the company hastily created a company union without proper input from employees and agreed to a contract, according to a complaint issued by the National Labor Relations Board. Then, Bauer's disbanded the in-house union and agreed to hold an election to determine whether the drivers wanted to join the Teamsters. The Teamsters lost, but the labor board believes Bauer's may have illegally influenced the vote. Gary Bauer, the company's CEO, denied that the company lacks labor harmony. "The bottom line is we have been in labor harmony," he said. "We've worked with them. We went to a vote. The employees voted. And they chose not to have the Teamsters come in. I don't know what more we can do to have labor harmony." Bauer said he hasn't decided whether to have another union vote, as the Teamsters have called for. The Teamsters union is making no secret of what it wants to achieve by picketing the company. "We are trying to put some pressure on MTA to enforce their policy," said Doug Bloch, political director of Teamsters Joint Council 7. "None of us think Bauer is ever going to come around on its own." MTA spokesman Paul Rose said the agency is in the process of reviewing the permits for the shuttle bus program and will make a decision by April 1 about which to permit. He said the agency is committed to preventing service disruption and furthering labor harmony. "Anyone who doesn't meet the requirements may not receive a permit for the program," he said.